A recruitment drive for Derry’s newest hotel is underway. Premier Inn is creating 60 jobs at its hotel and restaurant at Crescent Link. The hotel and Brewers Fayre family pub restaurant is expected to open in December. 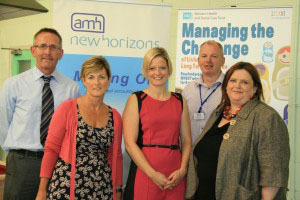 AMH New Horizons Foyle recently hosted a Premier Inn Information Session for the disability sector. Approximately 60 people attended the session which last 1.5 hours. It was facilitated by Edyth Dunlop NIUSE with guest speaker Cathy Hopkins, Cluster General Manager for Premier Inn, who gave a presentation on the background to Premier Inn, the types of jobs available and qualities they are looking for in their staff for the new hotel/restaurant. The information session was aimed at potential applicants to hear at first hand what career opportunities are available at Premier Inn and to ask any questions.